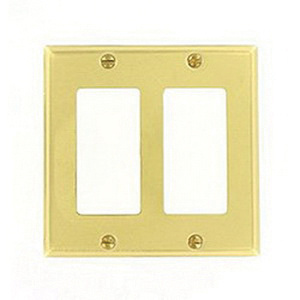 Mulberry 2-Gang Standard size GFI surge wallplate features solid brass construction and satin finish. The 0.04-Inch thick square wallplate has dimensions of 4.562-Inch x 4.5-Inch. It has two block duplex/GFI receptacle configuration. Architectural wallplate offers vertical orientation. Wallplate is UL listed.